$20 off $100+ Skil orders. Now through June 9, 2017, get $20 off select $100 Skil orders from ACME Tools. The deal is limited to select Skil products. 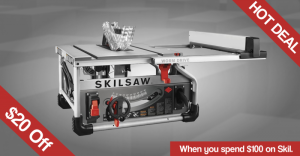 It looks like there are currently 34 tools and accessories that qualify for the discount; all of them appear to be tools that are part of Skil's professional line. Tools include their new wormdrive table saw, their professional circular saws, and their professional chop saws.